Size: 3" (7.5cm), females slightly larger. Tank setup: Well planted tank with good circulation. Compatibility: Mix with other community fish which are not too aggressive. Water chemistry: Fairly soft to hard, around neutral pH (6.5-7.5). Feeding: Carnivore: will accept flake as well as live and frozen foods. 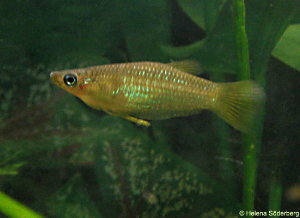 Sexing: Males have a gonopodium and longer ventral fins. Breeding: Liveberaer, anywhere between 20-100 fry may be produced. Comments: The common name refers to a keel shape formed by overlapping scales between the vent and tail fin.